So it seems to be a hardware limitation. As far as im aware of the current limitations of 70d are the 4gb, 30 minute limit, and also the 41 mbps write speed. So if i plan on shooting 30 minutes i would need to reduce the resolutions to around 1500x600p. (1500x600x24x14/8=38mbps) Drawing from this, ML Is preferable for film projects that usually have 1 minute scenes and not for documentary type of productions that have 20+ minutes of continuous footage. At this point im wondering if a 1500x600 RAW footage would beat a 1920x1080 h264. That will give me less detail when it comes to resolution but more detail when it comes to color depth. Dont take this as a slgith against ML and all the work that went into it, but since 1080p is now becoming industry standard, im guessing 1080p with h264 would probably be a better bet than a 14 bit raw video at half the resolution since i doubt upscaling 600p to 1080p would cut it even if it is 14bit. Dont take this as a slgith against ML and all the work that went into it, but since 1080p is now becoming industry standard, im guessing 1080p with h264 would probably be a better bet than a 14 bit raw video at half the resolution since i doubt upscaling 600p to 1080p would cut it even if it is 14bit. No, not really.... As already stated, it's a hardware limitation of the 70D. If you need 20+ minutes of continuous footage at 1920x1080 24fps 14-bit RAW, then get a 5D Mark III and put ML on it. The CF card interface of the 5D3 is plenty fast enough to accomplish your needs and ML runs beautifully on it for your RAW shooting pleasure. 30 minutes limit in RAW mode for 70D has yet to be confirmed. 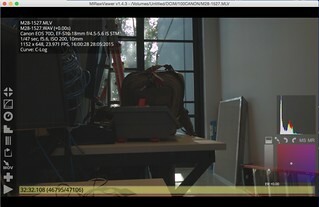 All other cams are doing seamless recording for +30 minutes with latest ML builds. There seems to be a bug in H.264 operation, though. ML (for other cams) will automatically restart recording after 29:59:59 break (loosing about 0.5 seconds during transistion). 70D's switch seems not to work, according to testers. And there is no 4 GB limit in 70D. Canon implemented file splitt without frame loss in H.264 some time ago for 650D and others. 5D Mark III is certainly up there when it comes to future purchases. I'm comparing it to GH4 which has 4k, but only has 8 bit color depth. 30 minutes limit in RAW mode for 70D has yet to be confirmed. And there is no 4 GB limit in 70D. Canon implemented file splitt without frame loss in H.264 some time ago for 650D and others. All other cams are doing seamless recording for +30 minutes with latest ML builds. My mistake 4gb limit was not 70d but due to the fat32 disks. It's not that big of an issue for me since it doesn't stop the recording. 30 minutes is when it stops and that is usually my main issue since I sometimes find myself recording along steep cliffs and slippery terrain that me not needing to go back multiple times to press the record button is not only more convenient but a lot safer. I do wonder, again forgive my lack of knowledge of ML, but could I possibly adjust the bit depth to perhaps 10 bit and record close to 1080p? That would be the ideal trade off?Something like 1536x864? 1536x864x24x10/8=40mbps. 10bit RAW: Not an option right now. If there ever will be: No idea. Take a look into HDMI recording, though. Camcorder might suit your needs better, I suppose. What is possible for RAW video at higher resolutions, is to start a new clip after a skipped frame. There will be a lag or time lost between clips. This is mission possible for 70D, and is done on the 5DM3. I am curious to know how fast a new movie can be started after a skip frame? It is not necessary to restart after skipped frame. There is option "Frame skipping" in MLV submenu. When can we expect to see audio monitoring? Its confirmed there is a bug, ISO range is not working when ISO is set to Auto. I tried an ISO range of 100-800, and found with auto ISO it would routinely go to 6400, 3200, 1600 depending on lighting. It works fine on 600D. Still looking for a bug entry log. I'm sure you think you are so smart and funny. However if you were you would realise that I was just asking if it was being worked on. I'm also sorry that your life is lacking something otherwise so you wouldn't have to post boring remarks. What news for Dual iso & Lightroom 6/camera raw 9 ? So I've finally gotten myself a 64GB Sandisk Extreme Plus SD card (80MB/s) and wanted to give the 70D a try with the 30+ mins continuous recording for MLV/RAW -- however I have a question to ask because when I set the MLV into smaller resolution such as 1280x720 in 23.97fps in order to try and surpass the 30 minute mark without filling up the card with the May 10 build from @nikfreak's post #986. For some reason, I don't think MLRV likes the spanning files directly from 70D because it won't playback at all on my 2006 MBP. I think it would be ideal to try this test again with smaller resolution just to see if it works -- correct? p.s. As soon as I get home from work and will try these files again on my more powerful Mac Mini to confirm this furthermore. Well I aggressively decided to try again and this time I only wanted to run it through just once (one MLV file was 63.85GB) as oppose to multiple files with multiple spanning files all over the directory (which I think it was causing the issue in playback earlier) and it played back just fine in MLRV with the new file... so I'm pretty sure it works just as long as you have enough space on your card as well as certain resolution to compensate for the 30+ minutes depending on your card spec's as well. So does this mean it is good news for all of us, after all? I'm thinking of upgrading my SD card for this. As stated before 70d can only take advantage of up to 41MB/s but tests show it's actually in the 38MB/s. If 26 minutes at that resolution would take 64 gb, its probably a good idea to buy the biggest possible capacity of sd card which is the 256 gb. I supposed 70D would do fine in this respect and it is nice to have it confirmed. Thanks! Well, today I finally got time to mess around with the FPS Override setting AND with the MLV video setting, by trying a timelapse. And more strange yet, right after recording it, if I took a picture, the image would come out cleanly, as if nothing happened. Updated first post with new download links. read changelog. Thanks @nikfreak for the update! Offtopic: me <<<<is Gemini, too. @DeafEyeJeydi Happy B-Day. Because the number of menu options is huge, I'm not asking one user to perform all the tests. Just pick a few features you are interested in, and test them thoroughly. Before including the 70D in the nightly builds, I'll disable all the features for which no feedback was received. Any volunteers with time for doing some kind of basic overview table (Example1 / Example2) for 70D.111A or 70D.111B (guess one would suffice) based on the available menu features latest download?? Hint: There's also a Burn-in test called "Quick test (around 15 min)" in debug menu which you can run!!! Thanks & Just downloaded Alpha 6 -- will test thoroughly as much as possible and report back to you!